"The use of the dual-clutch transmission for the 2009 Nissan GT-R marks the first application of the technology to a rear-mounted transaxle (front engine and transmission at the rear) layout. 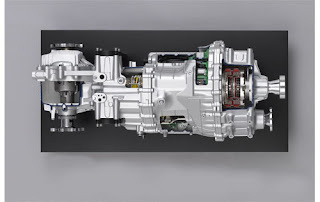 The GT-R's six-speed transmission features four of Borg Warner's DualTronic technologies, says the company, including the integrated dual-clutch module, clutch-control and shift-actuation modules, and synchronizer assemblies. The GT-R will go on sale in Japan next month and be available in other markets including the U.S. next year." Yea the corvettes have had a transaxle for 11 years now...but close. Yeah too bad the Corvette never had a dual clutch transmission which is what this article is reffering to... but close.